Gasoline electrical generators emit toxic carbon monoxide, which should make you think twice about where your genset exhaust is going. Not only could it kill you and your friends and families in their sleep, it could also drift down a sea wall and kill a boatload of unsuspecting strangers. Boaters have less to worry about thanks to Kohler's Ultra Low CO gensets that reduce toxic emissions (Carbon Monoxide) by a whopping huge 99 percent, as confirmed by EPA emissions testing. The Low CO generators also exceed both CARB (California Air Resources Board, the toughest folks around when it comes to emissions standards) and EPA standards for total emissions levels. Kohler cleaned up the emissions by developing sophisticated electronic fuel injection, and adding a catalytic converter to treat exhaust gases. There are two Ultra Low CO models, producing 5.0 and 7.3 kW. Both use the same 16-hp, two-cylinder engine; both weigh 205 pounds. Both have electronic brains that constantly monitor for 13 fault conditions and shut down the genset should it ever suffer low oil pressure. Another tantalizing possibility is Westerbeke's Safe-CO line of gas generators that eliminate more than 99 percent of this deadly gas (CO). 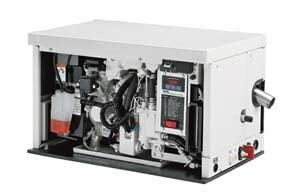 By way of sophisticated electronic fuel injection, the Safe-CO series of GenSets nearly eliminate the killer fumes. The sophisticated electronic fuel injection also boasts miserly fuel consumption. Another plus, electrical output features a utility-grade sine wave for powering personal computers and VCRs. Weight, a mere 165 pounds. But no matter what brand of low CO GenSet is busy humming away on your boat, make sure there's a CO detector installed an functioning. Remember. You neighbour's gas GenSet can kill you too.